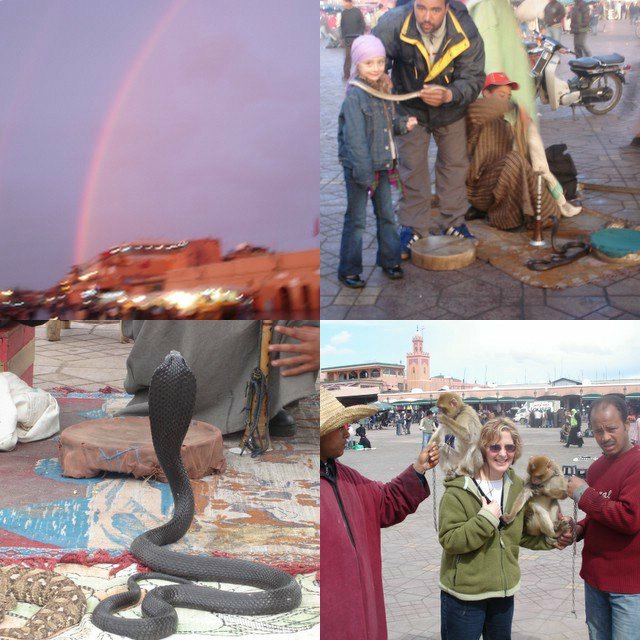 The famous square of Marrakech, Jemaa I-FnaThe famous town square of Marrakech, Jemaa l-Fna is full of active life, both day and night with street performers, snake charmers, fruit stands and freshly squeezed orange juice stands in every direction. The traffic flows in every direction simultaneously, crisscrossing with cars, mopeds, donkey carts, pedestrians, and horse carriages. How someone doesn�t get run over every few minutes is a major miracle. Once we saw a funeral, where all the men carried a women�s body on a green Moroccan carpet down the street, without coffin. Only the men are tasked with burying the dead, the women remain at home and are not allowed to visit the cemetery.